Building a successful, sustainable data analytics program takes effort…and a few other elements. The benefits are obvious including standardized processes, well-trained staff and abundant resources to continue the momentum. Auditors at the University of Texas System know firsthand what it takes to build a centralized data analytics program across a dispersed institution as broad as Texas itself. Mix of data types including student data, patient data, organizational, financial, staff, etc. 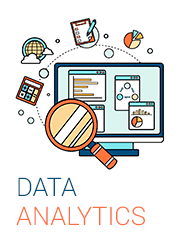 While the interest and willingness to use data analytics also varied by institution, the initiative was supported by management, which is the first (and most important) element to establish when working to build a cohesive data analytics program. A key driver in the success of the program was support from management. From adequate budget to support travel and tools, patience, support and even some cheerleading, the top-down backing of using data analytics made a difference in how the use of IDEA was rolled out across the organization. Data Analytics Program Manager, Erin Baker, was tasked with leading the initiative. During her career, Erin attended multiple IDEA training courses where she received hands-on instruction for everything from importing data to developing custom IDEAScripts. Erin became a Certified IDEA Data Analyst (CIDA) and received the 2016 IDEA User of Excellence Award. She worked with management to develop a distribution plan which covered steps for sharing her knowledge with audit departments at each institution and long-term plans to sustain the program. Management backed the effort with adequate funding for the technology investment and travel required to provide hands-on training and support. While some professionals welcome new technology, others need help adjusting to the unfamiliarity of using a new tool and implementing new processes. The University selected IDEA for its ease of use and familiar Windows-based user interface. While custom IDEAScripts were developed to meet specific audit objectives and automate repeatable processes, University auditors also used pre-developed scripts available within Passport and online resources such as IDEAscripting.com. Staff expanded their skills in scripting through training exercises and guided help. People are more likely to use something they are comfortable with. When they see the mechanics behind it and understand how it works, they are more likely to embrace it. Easy-to-use, menu-driven tools were developed within IDEA to help the internal auditors acquire data based on their specific environment, analyze data in key financial areas, extract and index outliers for further investigation and review the results. The Financial Activity Tool, which provides basic summaries of activities related to multiple financial processes, is used for multiple purposes, including risk assessment development and change management for departmental audits. Erin also developed a Procard Tool and a Travel & Entertainment Tool, both of which can be used across multiple institutions. One of the most important elements of the centralized data analytics program was investment in training. Staff have access to a variety of training programs, both in-person and online, which offer CPE credit – an incentive for those who may not have much interest in learning data analytics. General and topic-specific training to cover topics that apply to all institutions, which can also be customized to address specific institution challenges and environments. A focused training program empowers the auditors to apply the analytics to suit their own audit needs. Having a dedicated trainer helps the “expert” be viewed as a mentor rather than someone pushing them to try something new or different. Training opens the door for consultations on audits and projects that require specific expertise. In addition to a robust and ever-expanding series of training opportunities, Erin works as an internal data analytics consultant to help answer questions and guide them using IDEA. Auditors must “own” the audit and remain independent, but they can rely on Erin’s data analytics expertise and the IDEA Help Desk for one-on-one assistance using IDEA, which saves hours and prevents undue frustration. All online trainings are recorded and archived for auditors to access. The team has built a repository they can use as a reference or refresher whenever needed including slide decks, practice data sets and @functions. The intra-institutional training sessions have triggered discussions about ways each institution is using analytics in their audits and projects. This cross-sharing of information has helped auditors exchange ideas, best practices and troubleshooting tips with one another across the decentralized sets of institutions. Auditors post ideas and questions on a discussion board, which is also used to establish upcoming training topics. To help keep everyone’s skills sharp, weekly or monthly challenges are sent out to help staff increase their proficiency in using different functions and build their problem-solving abilities. One of the most critical factors is sharing success to create momentum. Developing a cross-institutional sprit of, “we’re all in this together,” has helped the auditors build their confidence in using data analytics in their work. The program is treated as a journey rather than a destination. Additional training courses are being added each year including more advanced training to increase aptitude levels. The University is also partnering with other higher education institutions to gather new ideas about how data analytics can be used within the organization. With the right tools, training, sharing and support from management, the function of internal auditor has helped evolve into one of trusted advisor. The University’s systemwide use of IDEA has benefited both the internal auditors who improve the quality of their work, and the auditees who gain more meaningful insights from the data. Special thanks to Erin Baker for sharing how the University of Texas System Administration is growing its data analytics program. Information for this article was sourced from a presentation by Erin at the 2017 IDEA Innovations Conference.